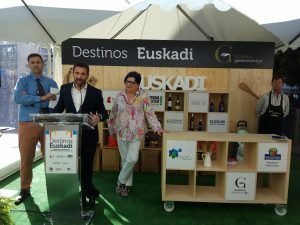 Bilbao, San Sebastián, Vitoria-Gasteiz, Hondarribia, Irun and Zarautz, components of the tourist brand ‘Basque Country Tourism’, and with the collaboration of the Tourism, Commerce and Consumption Department of the Basque Government, present their tourist offer in Seville since today until Sunday (27, 28 and 29 October 2017). 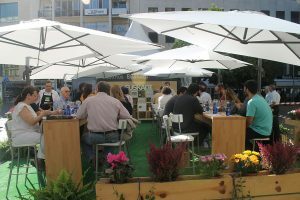 The ‘Basque Country Tourism’ space is located in the Plaza de la Encarnación, where you will be able to know each of the destinations, as well as the special programming that they offer to be able to plan the trip. 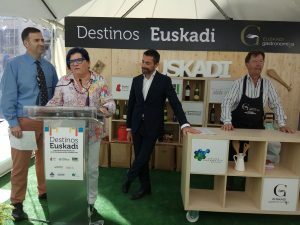 And is that ‘Basque Country Tourism’ is conceived as the best way to discover Euskadi, from the avant-gardism of its cities to the tranquility of its coastal towns, passing through the taste of its enogastronomic essence. Throughout these three days you can participate in commented tastings of wine pairing of the Basque wines with Denomination of Origin: Rioja Alavesa and the three Txakolis (from Álava, Bizkaia and Getaria) with cheese D.O. Idiazabal. 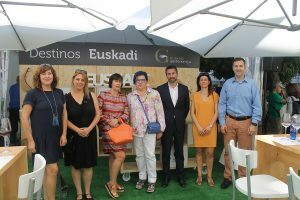 This activity is framed within the actions that the product club “Euskadi Gastronomika” makes for the promotion of Basuqe Country as an enogastronomic destination of international reference. To participate in the tastings, which are free, previous registration is necessary at the point of information. In addition, there will also be exhibitions of Basque rural sport with harrijasotzailes (rock lifters) and aizkolaris (log cutters) in the same Plaza de la Encarnación, where the general public can enjoy the demonstrations. from 11.00 to 15.00 and from 16.00 to 21.00. • Esther Facchin, Responsible for the Tourism Office of the City of Zarautz. • Clara Navas, Head of the Tourism Office of Vitoria-Gasteiz. • Mercedes Rodríguez, Director of Bilbao Tourism & Convention Bureau. • Antonio Jiménez, Manager of the Seville Tourism Consortium. • Isabel Aguirrezabala, Deputy Director of San Sebastián Turismo & Convention Bureau. 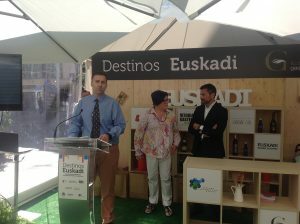 • Ixidor Larrañaga, Councilor of Tourism of the City of Zarautz.